This article about Chavoret Jaruboon by Richard S. Ehrlich appeared in The Washington Times in June, 2007. 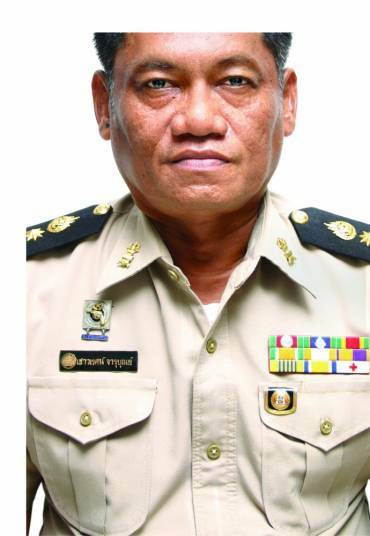 After two decades as an executioner, Mr. Chavoret switched jobs three years ago to become head of the foreign prisoners section at Bangkok’s dreaded Bang Kwang Central Prison, where he coordinates the detention of prisoners of many nationalities, including Americans. Years ago, foreigners dubbed the sprawling compound “The Bangkok Hilton,” and it now has about 500 inmates from 44 foreign countries in cages. Death sentences are still imposed at Bang Kwang Prison. Several Thais plus foreigners from Burma, Laos, China, Malaysia and Nigeria await lethal injection. Lethal injections began in December 2003, when four persons were executed in one day, including three arrested on charges of having 115,000 methamphetamine pills. Death row inmates in Thailand suffer a nebulous nightmare, because they never know when they will be yanked from their group’s grim cell. They spend years struggling to survive in the tropical prison, forming intense emotional bonds with other death row convicts, but can be chatting with a cellmate when suddenly a guard enters the group’s cell and seizes the condemned. Chavoret was one of about a dozen executioners who worked in shifts at Bang Kwang, using a 9 mm submachine gun fitted with a silencer. “I executed 55 people, including three women,” he said. Unlike firing squads in some countries where a line of riflemen simultaneously shoot a lone prisoner, Thailand’s system involved a single executioner to kill one convict.”One gun per prisoner,” Mr. Chavoret said. As brutal as modern methods may be, executions were more sadistic in the 15th century, when a royal Treason Act instructed executioners to be sadistic, much like they were in Europe. “Break open the skull, and drop in red-hot iron, so the brain spouts out like boiling liquid,” the law advised. “Shackle both elbows and both knees, and insert a stake, making movement impossible. Then, apply a flaming torch to the body, until death,” the Treason Act said, according to “Discovering Ayutthaya,” a book by the Thai historian Charnvit Kasetsiri, describing King Rachathirat II’s 1424-48 reign. Some historians say executions in Asia often are performed behind the prisoner’s back, and not face to face, because many fear the ghost of the dead will recognize the executioner and take revenge. By remaining behind the prisoner, the executioner avoids being the last face the condemned sees. To ease the executioner’s tension, a big cloth panel with a heart-high target is placed between the shooter and the convict, who is tied, standing, to a wooden cross. “When Thailand had the system of beheadings, they also chopped the person’s neck by jumping at them from behind. Maybe it was because the ghost might come back to haunt them,” he said. “I’m not going to say if I am now for or against the death penalty. But what I want to tell you is that Thai law still has this kind of penalty, and I don’t want anyone to have to get to that point. “The most important thing is not to kill the wrong guy, or a scapegoat. “There were some people who said they were innocent even when they entered the execution room, but it is not my responsibility to determine that.” Mr. Chavoret wrote a book titled “The Last Executioner,” which was published several months ago. Today, he tries to enjoy life with his wife, two sons and one daughter. He prefers lethal injection to shooting people in the back. “It is more humane because the body remains in the same condition – in its natural condition. The body is not going to be shot through the heart. I think the death penalty is to prevent crime, and to make an example of criminals. It is like when we had a campaign in Bangkok against littering. During that time, people did not throw things in the street. But when we took the signs down, people went back to littering.